Pick up any novel from your bookshelf and flick through it. What do you see on the pages? Indentations; gaps; short, sharp sentences; one-word responses; speech marks. Books aren’t just 300 pages of description and storytelling – they’re built on conversation. A single scene of dialogue between characters can achieve almost anything. It can show us a relationship, reveal some backstory, reinforce the plot, tug at the heartstrings, and even save the day. I said in my previous post on character description that plot is shown through the action taken by the characters – well, that all-important action often comes in the form of dialogue. So don’t mess it up. 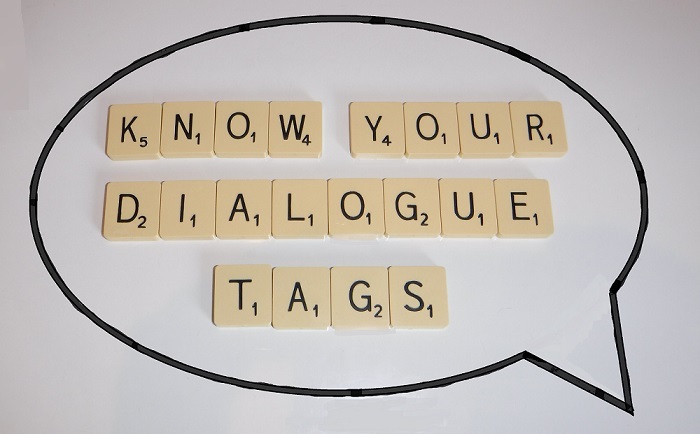 There’s plenty to discuss in terms of improving your characters’ dialogue – realism, slang, accent, syntax – but, for a lot of writers and critics, there’s one key issue that can make or break your story: dialogue tags. So grab your quotation marks, pull up a speech bubble, and let’s do this. He Said/She Said– Simple but effective, ‘said’ is the standard form of tag. He Said Sadly/Loudly/Quietly/Sexily – Tacking an adverb onto the ‘said’ tag changes the way the line is delivered. He Screamed/Roared/Whispered/Murmured – Replacing ‘said’ with a synonym instantly conveys the emotion of the speaker. So there you have it: three ways to dish out your dialogue tags. The end! Every writer, reader, and critic has their own opinion about which dialogue tags should and shouldn’t be used – and believe me, the arguing is more ferocious than Team Edward and Team Jacob clashing at a Twilight convention. But which is right? To smooth this issue out, we’ll look at the pros and cons of each type of tag – and then you can make up your own mind. If you’ve Googled writing advice or got your hands on some helpful books, you’ve probably come across Stephen King’s book On Writing. If you haven’t, here’s a list of his top dos and don’ts (mostly don’ts) when writing. King is the fearsome leader of Team Said because he suggests writers use nothing else. ‘Said’ is the limit, people. Members of Team Said like the simplicity of it. With ‘said’, dialogue tags fade into the background, often being overlooked by readers when they’re acting out the conversation in their heads. With said, the dialogue itself conveys emotion, rather than relying on pointers from the resulting tag. “You’ve hurt me in ways I can’t even explain, Tom. I’ll never forgive you,” Jessica said. Who needs more than ‘said’ there, eh? The words speak for themselves. Adverbial dialogue tags – of the ‘he said wickedly’ variety – are the most hated type of tag. King goes so far as to say: I believe the road to hell is paved with adverbs. We get it, Stephen – you really don’t like adverbs. (See what I did there?) But guess who does like them? Loads of writers. Bestselling writers. J.K. Rowling, Charles Dickens, Charlaine Harris, Dan Brown… Okay, so Dan Brown isn’t exactly the pinnacle of literary genius, but millions of people have read his books and enjoyed them. Adverbs give the reader a little bit of extra information about the delivery of the line – but they can be clunky. Obvious. Redundant. Think about poor old Jessica from above: do we need to say ‘sadly’ about her speech? She’s obviously upset, isn’t she? “You’ve hurt me in ways I can’t even explain, Tom. I’ll never forgive you,” Jessica said jokily. Clearly there are some things you just can’t express with ‘said’. You know who used said synonyms? Charlotte Brontë. And a woman can get on the Literary Canon by using synonyms, the technique’s alright by me. Synonyms cut out ‘said’ entirely and replace it with a descriptive alternative: the reader instantly gets the intended effect of the line. And without using a clunky adverb, either. “You’ve hurt me in ways I can’t even explain, Tom. I’ll never forgive you,” Jessica joked. Literary writers and critics look down on ‘said’ synonyms – as well as forty-two million other things – because they’re 1) often overused, and 2) feel a bit Hollywood/children’s book. I suppose it’s a bit like the show, don’t tell debate: by using a synonym, you spell it out for the reader. You tell them about the line rather than showing it. But, if it works in a way that nothing else does, what’s so wrong with that? Who said you need to mention speech at all? “You’ve hurt me in ways I can’t even explain, Tom. I’ll never forgive you.” Jessica rubbed her nudged shoulder, grinning. An action on the same line as speech indicates that that person was speaking. It’s a shortcut, a way of avoiding dialogue tags completely – traditional ones, anyway. It’s also more show than tell, which is always a good thing. If you’re writing a conversation between two people – in this case, Tom and Jessica – then you don’t need to signpost every change in speaker. (Save that for if you’ve included an action like a knock on the door, or a description about the scene/setting. Anything that disrupts the back-and-forth rhythm.) Although using names directly in dialogue can be jarring – how often do you use people’s name when you talk to them? – the times when they work naturally in sentences makes it clear who’s speaking: the other person in the scene. In the case of my example, removing all tags completely results in the meaning of the line being lost. But, in a chunk of dialogue, what comes before or after it can do the job instead. Within the context of a friendly, teasing scene, Jessica’s remarks would make complete sense. It’s all about context; about the conversation the dialogue nestles within. So, who won? ‘Said’, ‘said angrily’, ‘shouted’, ‘she clenched her fists’, or no dialogue tags at all? Hopefully you’ll agree with me when I say that, actually, they all won. Use them all. Use whatever you need at that particular moment to give your dialogue the impact it requires. Writing shouldn’t be a battle between techniques, and we shouldn’t look down on each other for using certain devices. We all have our preferences, and that’s fine. Every one of the examples in this post has a place, a purpose – it’s just up to you to decide how and when to use them. Here are a few ideas. ‘Said’ – This should be your first choice, your default option. Use it when the words are working for themselves; when the meaning in clear. Use ‘said’ to be invisible in the conversation. ‘Said’ + Adverb – Use this the least and save it for when it’s really needed, when there’s no other way to express something. For example: ‘said sarcastically’. Adverbs are the most tempting type of tag to write, the easiest option – but the easiest option isn’t always the best. I don’t believe in a ‘never, ever, ever do this!‘ approach to advice, but generally adverbs are best kept to a minimum. ‘Said’ Synonym – If the speech itself can’t convey the emotion or action behind it, use a said synonym. An exclamation mark might show anger, but you’ll struggle to show whispering without saying ‘he said quietly’. Stick to ‘he whispered’ – but not all the time. Save these up for the best moments, and surround them with other options. Don’t fall into OTT soap opera territory. Nothing – If it’s clear who is speaking and what they’re feeling, then the narrator doesn’t have to say a word. Let the dialogue speak for itself on the page. I always say ‘everything in moderation’, but it’s true. A book full of only ‘said’ would get dull, just as an adverb after every one of those ‘said’s would drive a reader to madness. And not everything has to be shouted, whispered, or declared, either. Characters don’t need to be constantly moving, and no tags at all would be confusing and boring for the reader. Use whichever technique you feel best suits the impression you want to give. Vary your options, cycling through the different types of tag like items in a toolbox. Use the best one for the job. Stephen King might’ve sold a lot of books from just saying ‘said’ – but you’re not Stephen King, are you? Just be you, and let your characters speak for themselves. Well done for getting to the end. Here, have some Smarties. What kind of dialogue tag do you prefer? Does one really get on your nerves? Is this something you have a problem with yourself? Here here. Finally a reasoned argument advocating them all. It’s not sitting on the fence, it’s equipping yourself with every tool in the garage, smashing down the fence and BUILDING A FRIKKIN’ CASTLE. Great metaphor, and I’m glad you agree! The ‘never do THIS, you idiot!’ school of writing advice has never sat well with me. If something works, it works – and nobody should have to defend themselves for using it. Writing is a tough enough business (and hobby) without in-fighting, too. I always thought dialogue tags were a question of style rather than one way being ‘right’ and the others being ‘wrong.’ It’s nice to see someone bring up some excellent concrete examples of writers who successfully use all these techniques. Thanks, I (obviously) agree! Many people get very hostile and dictatorial about dialogue tags, but it’s so unnecessary. You’re right – it’s all down to personal style. And who are we to question that? !